Twitter is lit up thanks to this advertisement. When was the last time you saw an advertisement for a charpai - the good old wooden and jute hand-woven bed - going viral? Well, there's an ad for the desi bed that's taking over Twitter currently and it has come all the way from Australia. A picture of the ad reads: "Traditional Indian Day Bed - Charpoy". It shows a picture of said bed and lists details about it. Only, this charpai is '100% Australian made' and costs 990 Australian dollars - that's approximately Rs 50,000. No kidding. 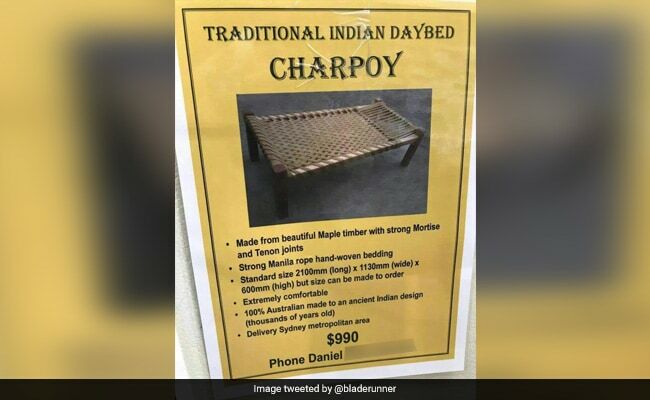 According to SBS Punjabi, Sydney resident Daniel Bloore, who first noticed a charpai during his visit to India in 2010, is manufacturing the special beds. He uses one for himself and after making one for a friend, decided to sell them to others interested as well. "I dropped a flyer at an Indian grocery shop some six months ago and since then, the response has been overwhelming," he told SBS Punjabi. For those wondering why these charpais cost so much, Daniel says it is a lot of work to make them. "The timber and the rope cost almost half of the price and then it takes many hours to make the frame," he told SBS Punjabi, adding that it takes him up to a week to make one. Twitter is of course lit up thanks to this advertisement. This isn't the first time a videsi advertisement for a desi product went viral. Earlier, an ad for good old miswak sold as raw toothbrush for over Rs 300 each made it online.